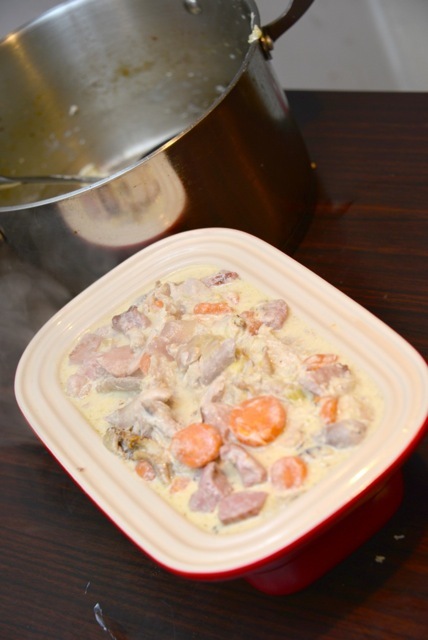 This is a great warming winter dish for using up any pheasant you have still in the freezer. We use this throughout the season for a beaters’ lunch or as an alternative to the traditional Sunday roast. I make this with ready-made puff pastry, but if you have the inclination, you are welcome to make your own. Take two oven-ready pheasants – by now my freezer is full to bursting with them. Seal the birds in a hot frying pan, with a little vegetable oil to add colour to the skin and improve the flavor. Place the pheasants in a saucepan with standard stock vegetables, such as carrots, celery and an onion (feel free to add any others you like). Add salt and pepper to season, a couple of pints of water, bring to the boil and simmer for around 45 minutes. While the pheasant is simmering away, fry off the bacon. My local butcher’s does a fantastic deal on chopped smoked bacon off-cuts – these have more flavor and also are cheaper than rashers of bacon, but they will also work fine for this if you can’t find any offcuts. 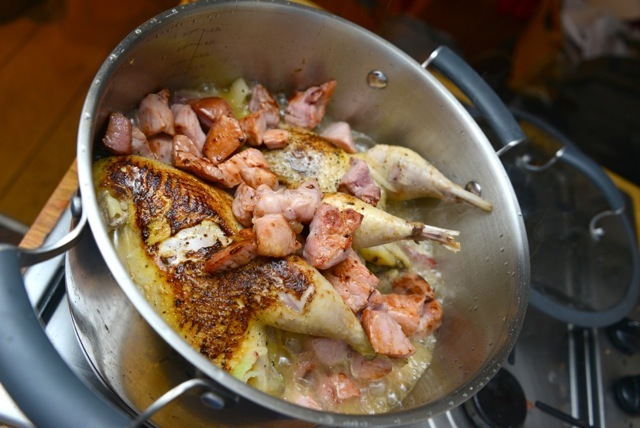 Once the bacon is cooked, add it to the saucepan with the simmering pheasants. When the pheasant is cooked, remove it from the saucepan and reduce the stock. Allow the pheasant to cool, pull all the meat from the carcasses and place this meat back into the stock, with half-a-pint of cream. 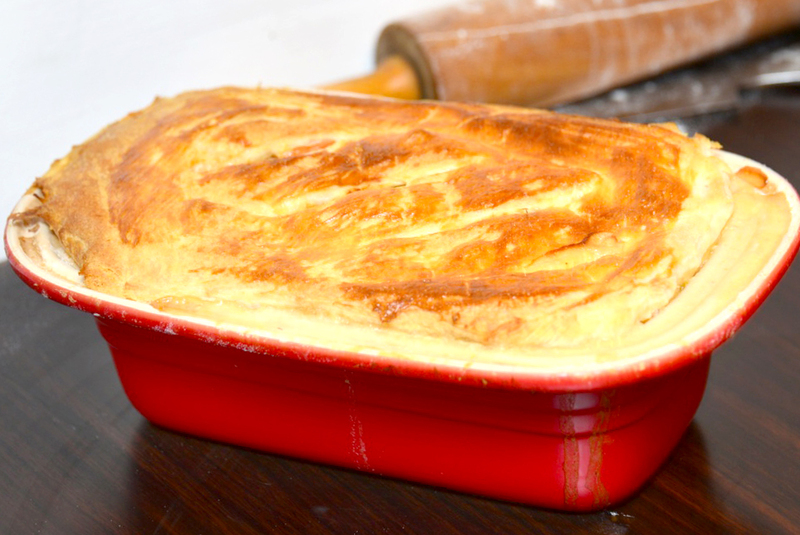 Pop the contents of the saucepan into a deep pie dish. It’s now time to add the puff pastry top. Roll out a sheet about 5mm thick and place over the pie dish. Make sure you add a couple of slits in it to allow the steam to escape. Brush the top of the pie with a little beaten egg and then put in the oven at around 180c 350F for approximately 30 minutes, or until golden brown. It’s a good idea to check for the colouring every 10 minutes. Serve with creamy mashed potato. Pheasants and bacon. How can it go wrong?